January 2015 n Performance & Hotrod Business n 101 The leader should facilitate the discus- sion and direct the grouping and combina- tion of related ideas and concepts. They should make sure that the entire group agrees and is in consensus when perform- ing these tasks. Build on Ideas and Concepts Once ideas and concepts have been combined, the leader should facilitate additional feedback and brainstorm ways to build and expand upon them. 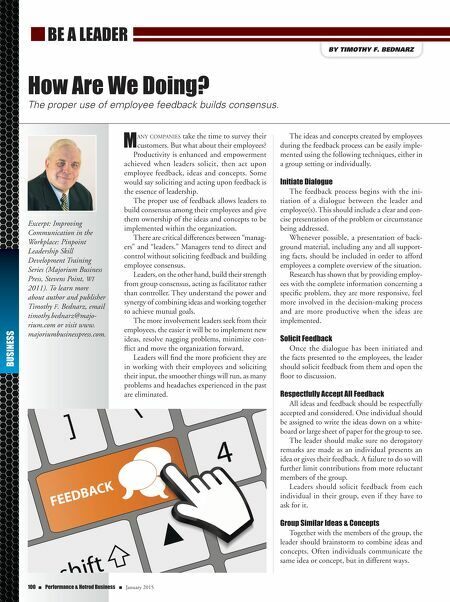 Leaders should make sure that all mem- bers of the group are involved and that their additional feedback is solicited. As new points are added and expanded upon, the group should always reach consensus before moving forward. Prioritize After adequate discussion has been concluded and the group has run out of new ideas, a consensus should be reached regarding prioritization of the refined ideas/concepts. The basis for prioritizing each of the ideas should be that which best meets the criteria for resolving the problem or situ- ation presented at the beginning of the discussion. Assess Feasibility Every organization has a limited amount of human, financial and physi- cal resources. Leaders will find that the group will typically develop a number of ideas; however, available resources make it impossible to implement each of them. 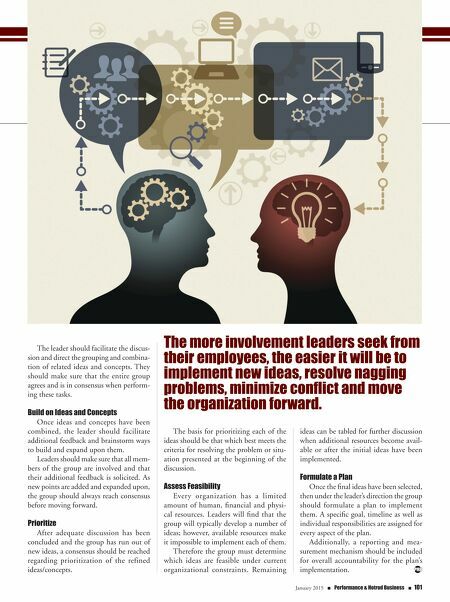 Therefore the group must determine which ideas are feasible under current organizational constraints. Remaining ideas can be tabled for further discussion when additional resources become avail- able or after the initial ideas have been implemented. Formulate a Plan Once the final ideas have been selected, then under the leader's direction the group should formulate a plan to implement them. A specific goal, timeline as well as individual responsibilities are assigned for every aspect of the plan. Additionally, a reporting and mea- surement mechanism should be included for overall accountability for the plan's implementation. The more involvement leaders seek from their employees, the easier it will be to implement new ideas, resolve nagging problems, minimize conflict and move the organization forward.